We celebrated ninth anniversary of late Fr.Slavko's death who died on November 24, 2000 at 3.30 on the top of the Cross Mountain after having completed the Way of the Cross. Numerous parishoners and pilgrims climbed the Cross Mountian praying the Way of the Cross at 2 p.m. that was led by Fr. Vjekoslav Milicevic. At 6 p.m. Fr. 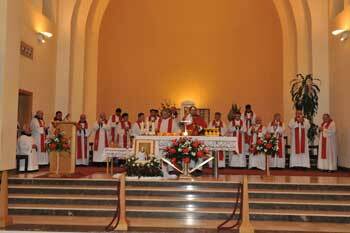 Danko Perutina celebrated Holy Mass in the parish church along with 18 other priests that concelebrated. In his homily, amongst the other things, he said how Fr. Slavko had special love towards Christ and Blessed Virgin Mary and added how Fr. Slavko once said that if we want to grow, we need to plant into ourselves God’s words for they are the material from which our construction will have firmness, truth and security. They are stability by which we drive away the attacks of the evil. During the whole day many pilgrims and parishioners were visiting Fr. Slavko’s grave on the local cemetery Kovacica.